The answer to this question is provided by Colleen Kettles, former legal counsel for the Florida Solar Energy Center and current Executive Director of the Florida Solar Energy Research and Education Foundation. Florida law forbids ordinances, deed restrictions, covenants, or similar binding agreements from prohibiting solar equipment use. 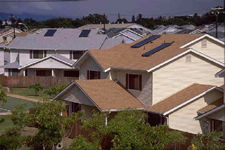 Under this law, a homeowner may not be denied by "any entity granted the power or right in any deed restriction, covenant or similar binding agreement to approve, forbid, control, or direct alteration of property..." permission to install a solar collector, clothesline, or other energy device using renewable resources. While a homeowner cannot be prevented from installing a solar energy system, certain restrictions may be imposed without violating the law. However, those restrictions must be reasonable, not arbitrary, and uniformly imposed on homeowners in a subdivision. The restrictions cannot act to impair the performance of a solar system or it may be seen as "effectively" prohibiting solar. The law specifically prohibits a homeowner association from preventing the installation of solar collectors on the roof. Although the association may determine where on the roof the collectors may be installed, so long as the installation is within the area required for its effective operation, that is, south, east or west of due south. The association is, thereby, limited in imposing requirements which would effectively restrict the system's operating efficiency or increase the system installation cost. As such, requirements for screening the system from view, whether by trees or fences, ground mounting, or limiting installation to an area not visible from the street, are contrary to the spirit and letter of the law, if the association change impairs the efficiency of the system. Requiring the system to conform to a certain color (i.e., blending with the color of the roof) is also prohibited by the statute, since the collector surface must be black to effectively absorb the sun's heat (and, in fact, is the only available material on the market). There has been some litigation with respect to the applicability of Section 163.04. (See Florida Statute Section 163.04 below.) However, most cases have been resolved through mediation. One such case involved the installation of a solar pool heater on the roof of a home. In this case, the association filed an injunction requesting removal of the rooftop system and instead required that the system be ground-mounted. This change would have impaired the system's operating efficiency, and the yard space was insufficient to allow ground-mounting. The parties settled, with the homeowner prevailing on the issue of roof mounting. The collectors were relocated to a less conspicuous area on the roof, and more panels were added to compensate for the loss of system efficiency. Another case dealt with the installation of a pool heating system on a residence which had been originally denied by the homeowners association board. The case was decided in favor of the association based on the sole issue of whether 163.04 applied to homeowner associations. The court held that the law did not apply to homeowner associations. Consequently, the law was amended to specifically include actions taken by homeowner associations. Another case dealt with the installation of a garage door screen. This case was resolved in the favor of the homeowner because it was determined that the screen provided a means of cooling the residence, and as such, constituted a passive solar measure. 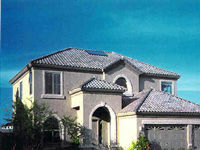 It is important to seek the approval of a homeowners association prior to the installation of a solar system. The law protecting the installation of solar does not waive the need for association approval if it is required by the governing documents. However, the Legislature has made successive amendments to Section 163.04 to better state its intent and to protect the rights of all solar consumers. This section applies to all actions taken with respect to approval or denial of a solar system, regardless of when the subdivision was instituted or when the association bylaws may have been adopted. Listed below is the text of the Florida Statute Section 163.04. (2) No deed restrictions, covenants, or similar binding agreements running with the land shall prohibit or have the effect of prohibiting solar collectors, clotheslines, or other energy devices based on renewable resources from being installed on buildings erected on the lots or parcels covered by the deed restrictions, covenants, or binding agreements. 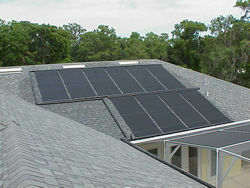 A property owner may not be denied permission to install solar collectors or other energy devices based on renewable resources by any entity granted the power or right in any deed restriction, covenant, or similar binding agreement to approve, forbid, control, or direct alteration of property with respect to residential dwellings not exceeding three stories in height. For purposes of this subsection, such entity may determine the specific location where solar collectors may be installed on the roof within an orientation to the south or within 45 ° east or west of due south provided that such determination does not impair the effective operation of the solar collectors. (3) In any litigation arising under the provisions of this section, the prevailing party shall be entitled to costs and reasonable attorney's fees. History.-s. 8, ch. 80-163; s. 1, ch. 92-89; s. 14, ch. 93-249.